(LiveScience) Your last chance to see a blue moon until 2015 will come around this Friday (Aug. 31), but don't expect an azure hue in the sky. In fact, "blue moon" refers not to color, but to rarity. Blue moons are defined as either the fourth full moon in a season, or, more recently, as the second full moon in a month. It's the second definition that covers August's blue moon; the month's first full moon was on Aug. 1. Blue moons happen because our calendar months don't precisely sync with the moon's orbit. It takes the moon 29.5 days to wax and wane from full to new to full again. With the exception of February, months are longer than that, meaning that once in a while the timing works out so there are two full moons in one month. Blue moons are best known from the phrase "once in a blue moon," meant to refer to something extremely rare. Two blue moons in a month aren't all that unusual, however; they occur 2.7 years apart on average, though not with great regularity. The last blue moon occurred on Dec. 31, 2009. That "New Year's Eve Blue Moon" also coincided with a partial lunar eclipse for viewers in Europe, Asia, Africa and some parts of Alaska. Another truly rare event is a year with two blue moons. The last time a single year had two months with two full moons was in 1999. The next time double blue moons will occur is in 2018. All of these dates are based on a new definition of "blue moon," however. In traditional folklore, blue moons were defined as the fourth full moon in a season (three being the norm). But that definition shifted in 1946, when a writer for Sky and Telescope magazine simplified the definition (or got it wrong, depending on your perspective) to the two-in-a-month phenomenon. The simpler definition caught on. The moon will be at its fullest at 9:58 a.m. EDT (1358 GMT) on Friday. 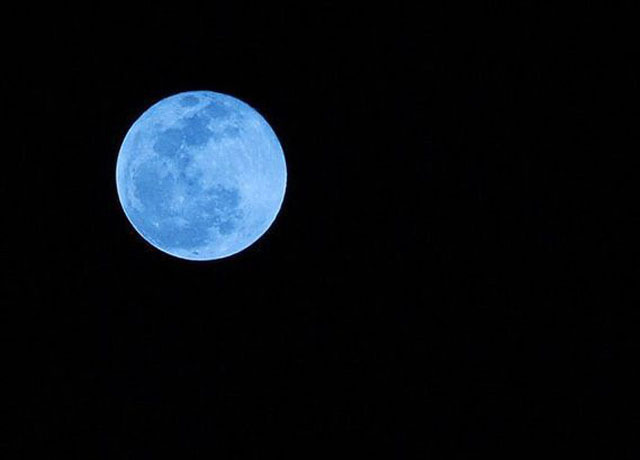 The next blue moon will occur on July 31, 2015.